I recently purchased an action camera for my 10 year old son from Ebay seller ‘Tradezone-UK’. It was a generic make, described as ‘1080P WIFI 12MP SJ4000 Waterproof Sports Camera HD’. On Christmas Day he plugged in the charger to charge the camera for first use. The plug exploded in his hand as he plugged it in. Thankfully the trip to our house is modern and tripped very quickly. 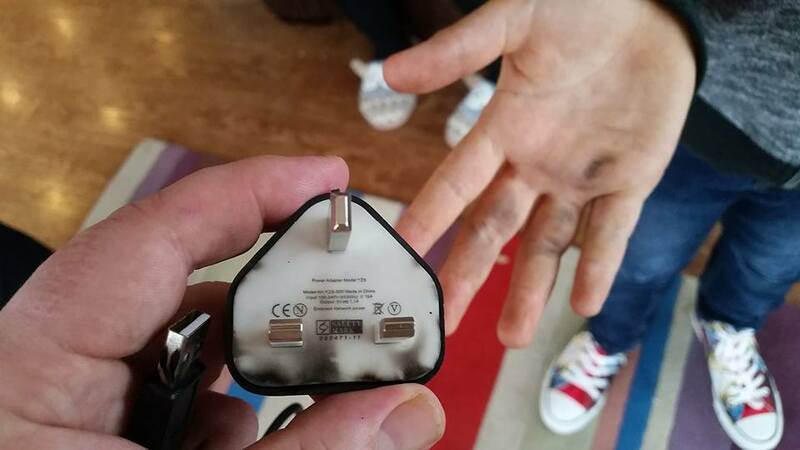 Sadly it not only burned the extension cable it was plugged into but also his hand. I attach photographs of the power supply for an action camera purchased from you for our 10 year old son. I’m very concerned that this happened. There is clearly someone seriously wrong with the power supply for this to have occurred. The plug shows that it has a CE mark. Is this genuine? I await your comments – including how to intend to compensate us for the damaged power supply, USB lead and plug socket. Thank you for your email, we4 are sorry for any inconvenience. We are seller only , we are not a manufacturer so , we will take strict action over it. If you want , then we are happy to send you new adapter. Working Hours: 8:00 Am to 5:00Pm Monday to Saturday. I have spoken with Citizens Advice today. You are the seller and my contract is with you, NOT the manufacturer. You are also responsible for any claims for consequential loss as a result of the faulty goods i.e. the damage to the extension lead. I therefore await your response. Also trading as Petatech on eBay. Selling fakes still.